A controversial subject I know however I thought it well worth sharing so you can form your own opinion on some benefits for your dog should you prefer a natural treatment. Hemp and dogs, who would have thought these 2 go together. They do and in this article, I will try to give you a better understanding. Hemp Oil activates the endocannabinoid system in mammals. – Relaxation, digestion.cardiovascular,memory and cognitive functions. The endocannabinoid system is also a key factor body’s anti-inflammatory efforts. This process is controlled by receptors in the brain. 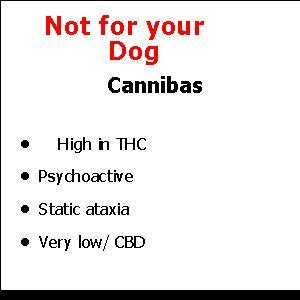 It is the same for humans who use cannabidiol or CBD and a lot of people throughout the world are reporting on how much it helps them so why not give it to your dog. Better than drugs. What are your thoughts? When buying Hemp oil be diligent because some products come from hemp that is grown in toxic soil. Russia and China are places that do this and are not recommended. Yes, it is way cheaper but I would avoid it at all times. Many of you that have a dog may have noticed when it stormy with Thunderstorms and lightning and high winds, your dog becomes anxious and shakes and needs to close to you because they feel frightened. Also, during guys Fawkes, dogs can become very anxious and often hide away with fear even though you have them inside in the safety of your home. As humans, we too get anxious at times and it is not different for your dog. Hemp oil and its properties are known to benefit anxiety and here is a product review to take a look at. 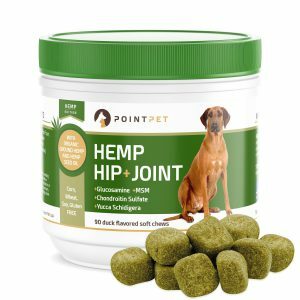 PointPet Advanced Hip and Joint Supplement for Dogs with Organic Hemp Seeds and Oil, Best Glucosamine Chondroitin, MSM, Omega 3-6, Improving mobility. Many dogs suffer from arthritis and as humans who have this, you know how painful it can be. Swollen joints, pain and the lack of movement and again it is no different for dogs except they can’t tell you. Hemp and Dogs you say. What!!! Well it has been studied and proven Hemp Oil is very beneficial to animals and it is natural so why not try it and see for yourself. When using Hemp oil products be aware if your dog has pancreatic problems, some oils have coconut oil in them. This is used as a binding agent. 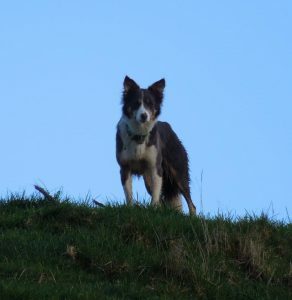 When you know you are about to do something with your dog, for example, they may get anxious when its time for grooming, putting a few drops in their mouth and within 15-20 you should notice they are much calmer. 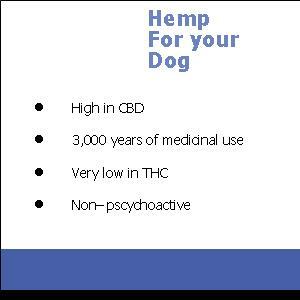 Is Hemp and Dogs something you have considered for your dog. Do you agree it is a great natural product or do you think it is wrong for dogs? Please leave your thought in the comment box as I would really love to know how you feel. 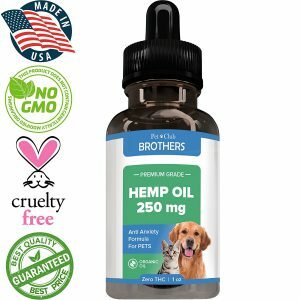 I really enjoyed this article on the benefits of hemp oil for dogs. I had never considered it, but it may be a good alternative for my older dog who is starting to develop arthritic issues. I hate the idea of giving him medications that can have very undesirable side effects. I much prefer the idea of a natural solution. Are you aware of any negative side effects associated with hemp oil? Thanks for the info! You could try the oil with omegas maybe as an overall treatment as I have heard with older dogs this works well. I am not aware of any negative side effects with hemp oil products, although I do suggest you buy product made in The USA not the cheaper ones from Russia or china as mentioned in my article as the hemp is not grown in quality soils. 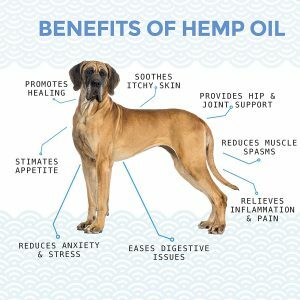 Hemp has many benefits for the health of pets so I am glad I am not the only one who is out their speaking on this topic. Thank you! So this is EXACTLY what we plan to get for one of our dogs for travelling. I purchased new tires for my F-150 that have a more aggressive (masculine) tread pattern and what I didn’t know then, was the more aggressive the tread pattern, the more road noise. Well, this road noise seems to hit a tune with our dog and she FREAKS right out. She now can’t travel in the truck without hoping into my wife’s lap in the front seat and just shakes and shakes. In the winter I had the dogs with me and had to drive by myself – the one dog that can’t stand the noise jumped into the front seat and curled up shaking where you put your feet. It was horrible and felt so bad for her. Great information, as long as it is natural and can be useful for your dog I say go for it. 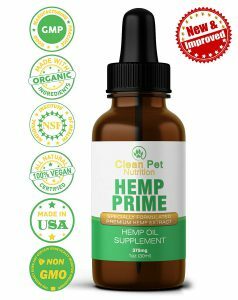 Each person knows what is best for their pet and if you have issues with your dog and have not tried hemp oil, you may want o consider it. What an interesting topic! I’m glad you pointed out that hemp products for dogs actually exist – I never would have thought. My parents have 4 large boxers and one of them is so easily frightened and anxious, I wonder if a product like this could help calm her down when company goes over there to visit from now on? Definitely something worth looking into, thanks for teaching me something new! Yes Im sure it would be really beneficial to your Parents boxer. I gather you have used hemp with your own dog? And has this helped? My dog suffers greatly from anxiety, I can never leave her alone for too long as she whines and scratches and drives the neighbors. Do you think that hemp oil could work for this? I would love to give it a try! Thanks so much for bringing my attention to this fabulous product! I’m sure it will help and should you buy the product please let me know how it goes with her.